17.Oktober 2016 - At the booth in the exhibit hall, a new pilot plant solution from Collin will manufacture PP film. 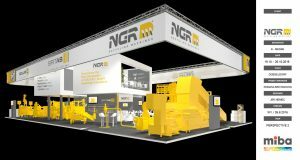 The film edge trims and film rolls will be further processed into rPellets by an NGR recycling machine. The processed plastics will then be returned back into film production. An inline melt characterization unit will also provide advanced quality control of the new plastics raw material during the recycling process. In this setup, the processing parameters will be further monitored, recorded and analyzed in real-time on the recycling machine, and displayed for attendees on mobile devices in easy-to-understand charts. This new form of human-machine communication is designed as S.M.A.R.T. Dialog: it provides for considerably improved equipment utilization, rationalization in terms of service and maintenance, and provides all the data to evaluate the recycling investment. The melt filtration system plays a critical role in the production of high-quality post-consumer pellets. The company will present the latest version of its band-melt-filter, which is easy to operate, supports more applications and allows for minimal operating costs. S.M.A.R.T. Dialog from NGR virtually enables the machinery to speak and alongside key operating data it provides the process analyses to ensure recycling success at minimal cost. As part of a live demo, the system will be demoed for the professional audience on mobile devices. Many evolutionary steps are increasing the output of NGR systems while also providing lower energy consumption. The P:React series will be presented for the first time; it follows the LSP process. With this technology, rPellets with better properties than virgin material can be produced and decontaminated reliably and within minutes. Additional offerings in the area of post-consumer recycling further round out the range of products and services.